I need some help or advice. But I guess I should start by explaining my story. 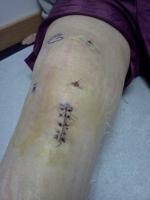 I tore my ACl, LCL and meniscus, so I had surgery to repair and fix them in 09. So after surgery my knee wouldn't go straight, I was missing 20 degrees. So 3 months after my ACL reconstruction my doc went and scoped my knee removing scar tissue. It helped and now I was only missing 10 degrees. After a year, he decided he wanted to try and remove more scar tissue so he scoped my knee again. It helped a little but still having troubles with my knee missing 7 degrees now. During basketball season this year I re-injured my knee. I got an MRI and it showed a lot of scar tissue in my knee, small tears in both lateral and medial meniscus. My knee hurts on the outside. My surgeon says he typically does surgery on it, but he doesn't want to do surgery on my knee because he says its not that bad of an injury and he's afraid of making my knee worse if he goes in there. I was wondering what I should do? I'm afraid that my knee wont get better, and I'm still having pain in my knee. Going down stairs hurts the most. I want my knee to get better because I'm on a basketball scholarship to a D1 university. So please give me advise on what I should do.